The workshop is for a very small group of participants and fills up fast. Register today! For out-of-town participants the location is minutes from the airport and there are multiple hotels within a five minute walk. Professionals who are serious about their career should be serious about their safety. This advanced workshop will teach people how to safely and effectively use one of the common tools of the film and theatre professions. 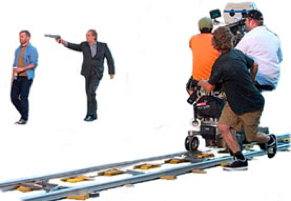 The Firearms Safety & Handling Actors Workshop is specifically designed for actors, producers, filmmakers and other industry professionals to learn about firearms safety, handling and authenticity on film and theatre sets. Participants will learn through demonstration, lecture, video examples and hands-on practice in a safe and controlled environment how to be safer and more comfortable when handling firearms on set. This workshop is designed to raise awareness about firearms safety in the entertainment industry and explain basic safety rules and industry guidelines. Not just for actors, it is open to all industry professionals who may be dealing with firearms. It details how to keep cast and crew safe when firearms or replica firearms are being handled on set and discusses the ways productions can get the look they want, safely and within budget. This advanced workshop will increase confidence, show you how to be more safe on set and demonstrate how responsible handling can help tell the story and add to the professionalism of a production. This is a three-day professional-level workshop that is informative, challenging and fun. A small group of participants work one-on-one with experienced instructors to maximize safety and confidence. 1) In your workshop, you get to practice with both blank-firing firearms PLUS real handguns with live ammunition? Why not just blanks? 2) I'm nervous around firearms. Is this workshop for me? 3) We are not using real firearms in our production. We're only using replicas. What can possibly go wrong with that? “There are always safety and legal issues even when using replicas. No one should be putting anything that looks like a gun in your hand unless they are prepared to follow some basic steps. One of the greatest myths about firearms in film is that replicas do not require safety standards and don't need to be handled by professionals. This is NOT correct and this workshop explains why." 4) Why should I care about authenticity? 6) What are some of the most common mistakes actors make with firearms? Registration requires a non-refundable registration fee of $150. Balance of the course fee is due the first day of class. With 30 years experience teaching law enforcement and government professionals how to shoot, instructor Dave Brown is one of few civilians considered an expert in police weapons training. 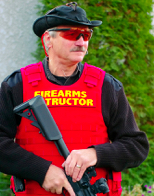 As one of the subject matter experts in the design of the Canadian Firearms Safety Course, he helped literally “write the book” on firearms safety in Canada. Dave has had numerous articles published in national and international police magazines, been recognized by courts as an expert witness and been invited to the House of Commons in Ottawa to share his expertise with the standing committee on national security. As firearms safety coordinator in film and theatre, Dave has been entrusted with the safety of hundreds of cast and crew. Known for a relaxed teaching style and an intense dedication to safety, he has coached some of the biggest names in Hollywood. Due to his vast experience in the industry, Dave has been invited to speak on the topic of firearms safety in film and theatre to workshops and conferences across Canada and the U.S., and helped design the firearms safety training module for all IATSE theatre and film technicians in North America. "Incredible! The confidence it gives you is amazing!" "... WAY beyond my expectations." "It provided everything I could have imagined and more." Read the interview with Dave Brown on L.A. Talk Radio’s program “Film Courage” here.